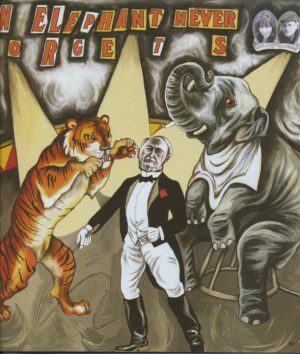 I wrote the narrative that goes with the art by Sue Coe about Topsy, An Elephant Never Forgets, which is published in Blab! Vol. 18 (Fantagraphics Books, 2007) the graphics novel annual featuring cutting-edge comics, illustration and design. The elephant whom we never want to forget is Topsy. We know more about how her life ended than we do about how it began. We can see from her photograph that she was an Asian elephant. Newspaper reports on her death in 1903 claim she was 28. This means that she was probably caught in India, Sri Lanka, Indochina or Indonesia in the mid 1870s. In 1887, Edison began experimenting with animals, primarily unwanted dogs and cats, by electrocuting them to prove AC was more dangerous than DC. These experiments were demonstrated to the press. Even though he opposed capital punishment, Edison secretly paid for the first electric chair to be built for the State of New York to demonstrate that AC was deadlier than DC. With 1,500 spectators who each paid 10 cents to watch, Topsy was electrocuted on January 4, 1903. It took 10 seconds for the 6,600 volts of electricity to kill her.